Hands up if you follow me on socials media? Well if you do, you will know that the key word of the moment both in my boutique and my personal style has been the Spanx Moto Leggings. They are the hottest product on the market at the moment and everyone wants to get their hands on them because they are literally miracle workers. They hold you in in all of the right places and they look damn cool in the process. 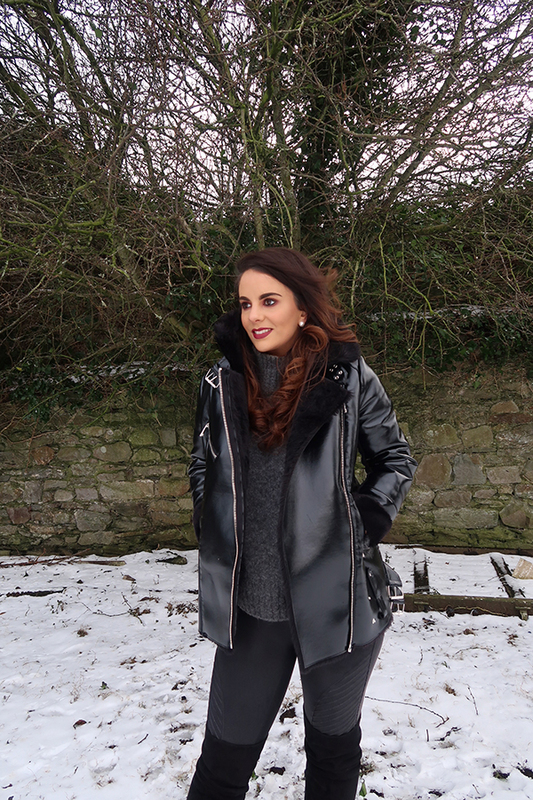 With top bloggers such as Sinead from The Beautiful Truth and Laura from Lauras Views recently showing them and how they would style theirs, lots of you have been asking what to wear with yours or how I style mine so I thought I would show you my “go to” pieces to match them with on a day to day basis. I’m obsessed with the biker trend and always have been, I literally live in black and leather so the Moto style were right up my street and I generally style them in a cool contemporary way with a funky jacket, oversized knits and black boots. As someone who has always been super conscious of their thighs, I never in a million years imagined that I would wear leggings (more so leather look leggings) with a short top, but the Spanx are so supportive and so comfortable that I literally feel I can wear any type of top with them and still feel confident and secure. They literally are the biggest game changer that I have come across since opening the boutique and my customers all over Ireland would most definitely agree. The Spanx leggings are not available to buy on my online shop but they can be purchased by calling the boutique on 00353 (0) 749322584 or by contacting me on Facebook or Instagram to arrange payment via Paypal.